The Ace of Clubs Glasses include one pair of glasses. Planning on winning big at cards? The Ace of Clubs Glasses will help you perfect your poker face! 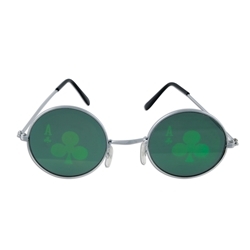 Their shimmery green tinted lenses are stamped with an ace of clubs decal, with polished silver wire frames. Wear them as part of your night-on-the-town ensemble, or pair with our Gambler Eye Shade for a real card-slingin' look!